﻿Corporate Catering From Hog Roast Beaumaris! Our Hog Roast Beaumaris chefs are well-trained and experienced in what they do, so when you book our catering services for your party or event, you can be sure of professionals at the helm. Nevertheless, our other team members are just as professional and just as dedicated to providing great, tasty, fresh, homemade food for our customers and their guests, with excellent service at the forefront of their minds each and every time. We’ve spent years making sure that everything we do exceeds and not just meets expectations, and that’s with customers old and new. We recently catered a corporate function for a company we’ve worked with for a long time, and most of the time they ask us to cook our famous pigs in buns for their get-togethers, which range from work parties to conferences and team-building events. This time, we would be cooking a feast specifically for their employees, to celebrate many years of hard work, so boss Billy called us to ask us to provide the catering and we guessed that he’d want those succulent pigs in buns, which he did. However, for this party, he also wanted some additional food served, including a potato dish and some salads, and he needed us to cater for a vegan staff member as well. Hog Roast Beaumaris can cater many kinds of diets if needed, so this wouldn’t be a problem at all, and Billy decided on our veggie skewers without the usual halloumi cheese, so tomatoes, mushrooms, peppers, red onion and courgette, grilled to perfection. We would also cook new potatoes in herbs and put together a seasonal leaf salad and our coleslaw. 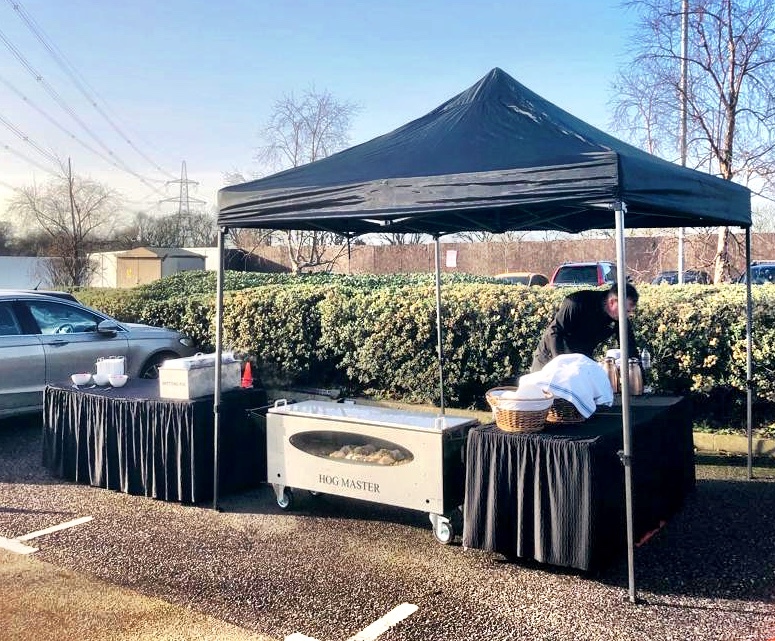 It came round to the day of the event on Friday and Hog Roast Beaumaris headed to the work premises and set up our equipment outside in the car park. It takes hours to roast a hog, as it needs to cook inside and out, slow and steady, but it’s worth the wait! By 2pm, we had a lovely feast ready for Billy and his staff, with hot food to warm them up and the cold food to complement it perfectly. Hog Roast Abersoch for a Charity Antiques Sale!